ENACTUS team from left, back row, Daniel Vonthin, Peter Urban, Logan Parsons, Cooper Ferguson, and Tomas Aleman. Front row, from left, Maebry McNeese, Abigail Brown, Shania Rogers, and Michaela Thomas. 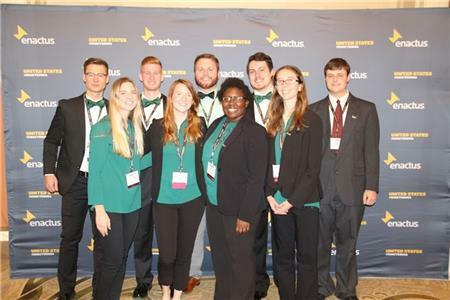 The Bryan College Enactus team presented a live, multi-media summary of the entrepreneurial-based projects they developed and implemented throughout the year at the Enactus United States Chicago Regional Competition. They were judged by a panel of business leaders on how successful they were at using business concepts, which empower people to transform opportunities into real, sustainable progress for themselves and their communities. Bryan College’s Enactus presentation team was named Regional Champions and will compete in the National Exposition in Kansas City in May. The team was led by Abigail Brown, a senior management major from Adams, Tn. and Logan Parsons, a senior marketing major from Crossville, Tn., Tomas Aleman, a freshman Management major from Seville, Spain, and Maebry McNeese, a senior marketing major from Nashville. The presentation team included Abigail Brown, Shania Rogers, a senior Management and Marketing major from Halls, Tn., Daniel Vonthin, a senior Marketing major from Wetzlar, Germany, Cooper Ferguson, a senior Film major from Cleveland, and Peter Urban, a freshman Management major from Fillmore, In. Michaela Thomas, a senior Leadership major from La Follette, Tn. provided audio-visual support. Bryan College’s Enactus team (formerly known as Students Incorporated for Free Enterprise, SIFE) has been a source of community organization and entrepreneurial project at Bryan College for over a decade.